"WE thank you for your support..."
Five tortaux gules two, two and one, and in chief, a roundel azure thereon three fleur-de-lys or. "IF we were springing for the full-color option... PLUS the crown of the Grand Dukes of Tuscany (We, by the Grace of God, US.) PLUS a drapery swirl with attitude." "The Medici thank you for your support!" "Assuming that you are giving us a double fist pump (a.k.a. The Rocky Thing)." "Not demonstrating elementary free-weight technique. 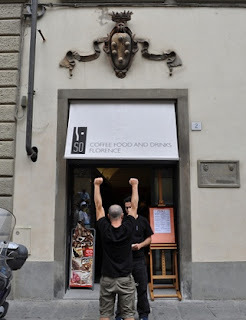 Or trying out for Jersey Shore: Season Four...in Florence (Dio ci salva / God save us!)" "But why bus in ringers from L'Altura del Littorale / Seaside Heights?" "Our Loyal Subjects have talent to spare! And these days, they all carry cell phones. So, you can have them at Via dei Vecchietti 6... in minutes! 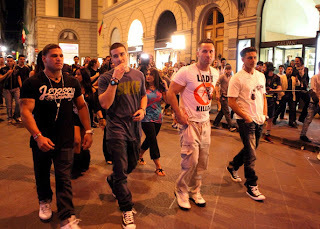 I saw Pauly D. and Vinnie a few months ago near the Mercato di San Lorenzo - "just hanging out" with a lot of entourage. BUT WHY HERE???!!! Florence is normally the most un-guido of towns. There are many down-home types and there is a strong popular culture - but folks JUST DON'T DO GUIDO. The crew could have staked out Rimini, Viareggio or a host of other places where there are beach and club scenes beyound the wildest dreams of Seaside Heights!